I've been on the hunt for this book for easily ten years. I have a special place in my soul for mysterious objects. The perfect cube of advanced metal alloy found hundreds of feet beneath the Earths' surface embedded in a layer of coal comes to mind. There is something about no explanation that brings more focus and analyzation to a subject than it may or may not deserve. For me, it's like a virus. The challenge of finding, not necessarily, a complete answer, but something close will plunge me into a delightful referential mania. 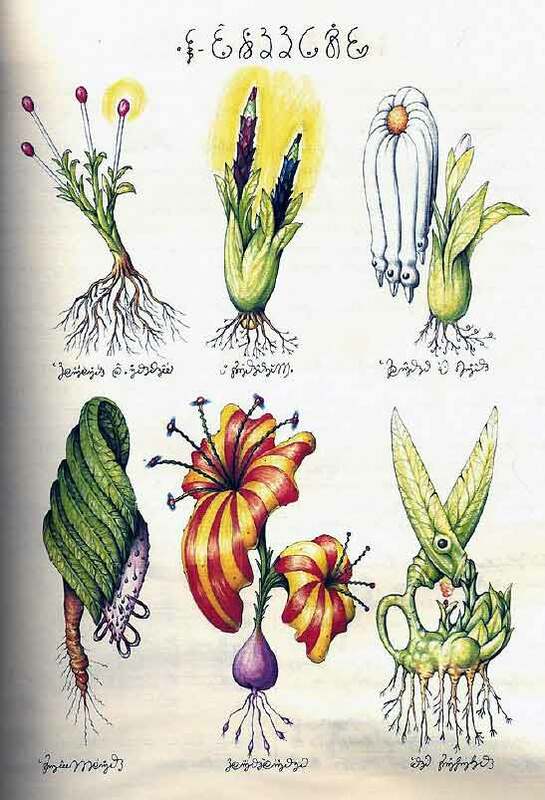 The Codex Seraphinianus, written (drawn) by Italian artist-designer-architect Luigi Serafini, is a hard book to find. Published in 1978, the original 370 page volume, is bound in black satin with embossed silver lettering and a color 'paste down' graphic on the cover. The pages are printed on handmade Italian paper. The original 5000 can go from anywhere between $400 to $13,000. Small runs, in later years were paperback and go for $200-$700. All the pages are hand drawn in what looks like ink and gouche. Completed in 30 months, he was producing a page every 2.5 days. Over the last ten years, scans of the pages available on the web have grown gradually. My curiosity grew exponentially the more I saw. The book appears to be a natural history encyclopedia of the geology, physics, molecular structure, plant life, microscopic life, and animal life of a different planet. A planet not much unlike ours. It is written in an unknown language. 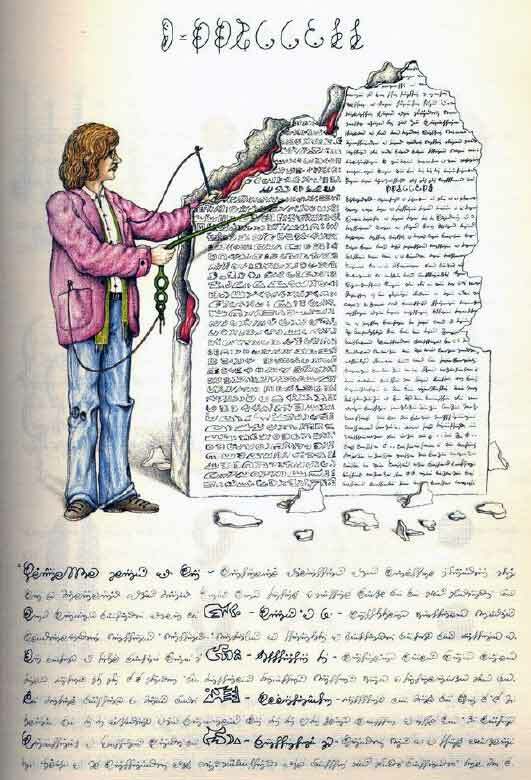 The glyphs of this alphabet have challenged a number of code breakers to no avail even though there is an illustration that appears to show the author standing next to a 7ft Rosetta Stone type object with a number of symbol conventions displayed on it. There is A LOT of writing in this book. Enough writing that my ideas of it being jibberish faded away quickly. There is also enough cadence to the sentence length and structure that I'm sure there is meaning behind those symbols. Still a mystery. Luigi is still alive, and apparently he's not talking. 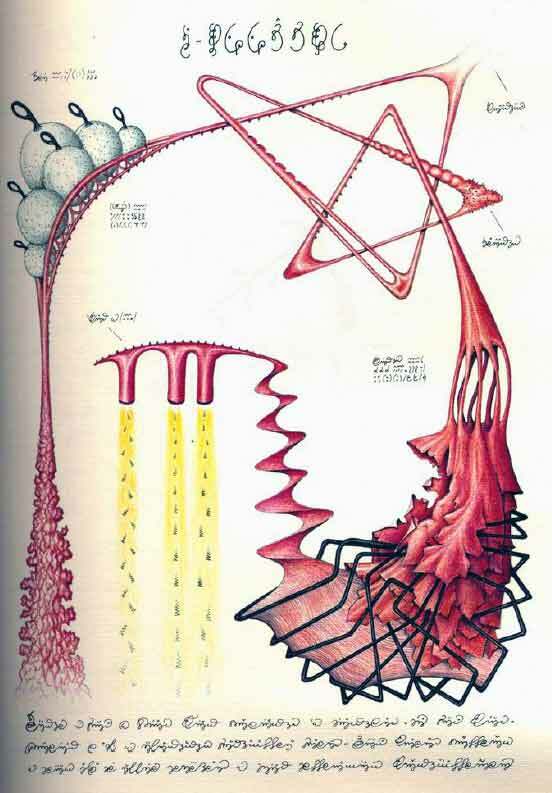 The illustrations in this book are so fantastical, carefully detailed, and soberly scientific, I began to wonder if Luigi had some kind of alien connection or other dimensional portal he was accessing. Perhaps he was visiting another world and journaling ala Darwin. Until recently. Somehow, perhaps because of lapse copyright, the entire book has been scanned. There is another half of the book that is an obvious commentary on human existence. Pollution, out of control industry, war and other general human foolishness is gaffed. Serafini also takes advantage of our captive audience by introducing his whimsical architecture ideas and 'green' Rube Goldberg-like inventions. Now the mystery is not as deep for me. The human motivation is obvious: 60's utopian rainbow subjects and anti-war political statements, though it does not detract from the masterpiece of the entire work. Herculean in achievement and truly epic in its' consistency, it's hard for me to criticize this piece of art in the least. BUT, if I were to create such a work, I might take strategic advantage of not explaining too much. I might keep it mysterious. Like the Voynich manuscript. I might bury it deep in the ground so future generations, upon discovering it, could ponder its' unexplainable features. It's hard to make something unexplainable. It's hard to make a mysterious object. If you like this stuff, you might also like Walmor Corréa. Thanks for the pdf. It's great!